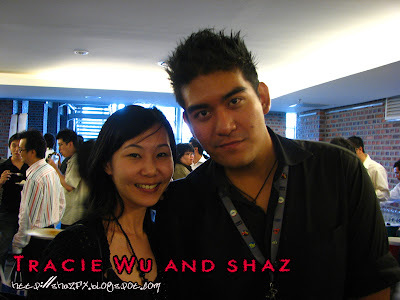 Karen Kong, one of Malaysia's reknown chinese artist who made it big at the age of 23, been on many radio stations especially Xfresh FM and MyFM! Received the support of hundreds and thousands of Malaysians and her fans from the internet as well. On her recent album launch at KL Pac, she unveiled her latest album entitled "Showtime" and guess what... Prodigee Media announced that Karen's latest album will NOT BE AVAILABLE in STORES or anywhere outside for SALE. As Karen's recording label has decided, that the only way to fight against piracy here in Malaysia in order for our local Malaysian artists to survive is thru selling original albums and not let fans / listeners to buy pirated album... as artists such as Karen and others would want to survive as well, make a living and earn some money... this is in order to produce better and more albums in the near future. Therefore you may be asking, where can you purchase Karen Kong's latest album "SHOWTIME". Wel, the answer is that Karen will be having 50 on ground concerts / events this coming 2008, therefore fans are able to purchase Karen's album at the location itself and that's the only place for you to purchase it! Anyways, i was there at the press conference with Joey and another friend... i didn't really eat much at the PC as the FREE FLOW of Baskin Robbins Ice-Cream at their Cafe outlet was really AWESOME!!! This is what you'll see from the back if you were to be here at the Press Conference... heaps of photographers / media members trying to take a picture of the up & growing star of Malaysia! Here's Tracie and Me... we were here!!! Tracie was my client from Universal Music and now she's workin for BIMBIT! 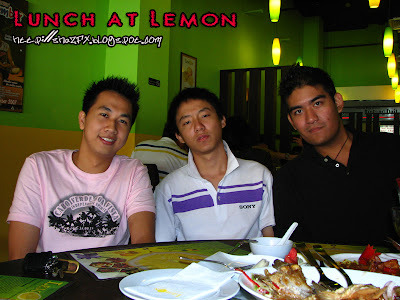 Anyways, here's a 1-picture story of our lunch at LEMON Restaurant @ The Mines last 2 weeks ago with Shawn and Gary. WE had an awesome time eating GREAT FOOD! More updates about this coming up soon! 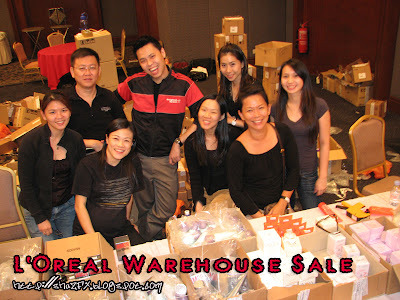 By the way, Jonathan invited me to the L'Oreal warehouse sale... to purchase stuffs from L'Oreal and their other brands such as Lancome HOMME, and Biotherme HOMME!!! All are going at cheap prices!!! Met up with Rob here as well! 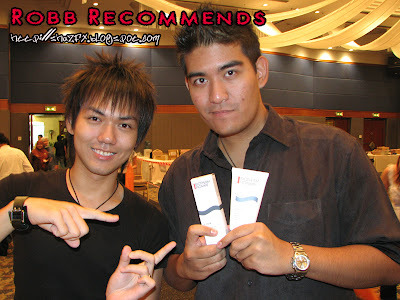 He told me to get Biotherm as well!! So i ended up getting Biotherm products today! 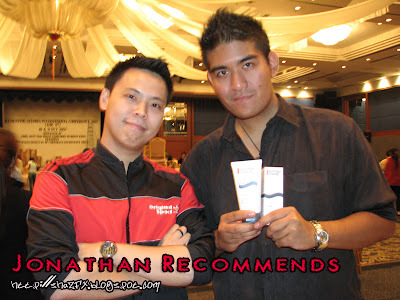 And Jonathan too recommends me to get Biotherm products!!! Well fighting piracy in this line has been quite tough over the recent years, almost anyone and everyone is able to purchase pirated copies of albums / movie titles... the thing is why this needs to be done is to help the artist survive in this industry and further produce great titles and albums in the future. 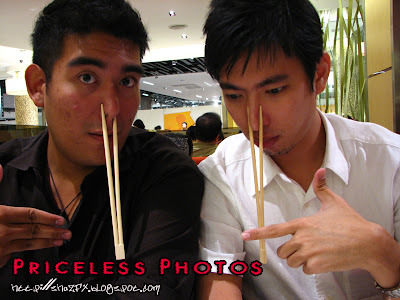 Therefore the action that is being taken by Karen and Prodigee Media i would say is very BOLD as they are taking this first step in combatting piracy in Malaysia, setting a foot into the right direction and hopefully many other local artists are to realise that this is what needs to be done in order to survive in the future!!! So, help support your local music industry by starting to buy the ORIGINALS! Yes, really... try your very best to purchase the originals and not pirated stuffs. Before i end my post here, i would just like to ponder upon the fact that getting a copy of this album is not as hard as it seems...as a pirate can purchase the first album or something from one of Karen's 50 on ground event / concert... thus the pirate is able to duplicate and sell the copies on ground as the album is not widely available. Desperate fans would want to purchase ANY copy of the album first because they want to hear Karen's songs! And they wouldn't mind going the extra mile to another shopping mall to buy the original, but in this case the CD is not widely available... so what's going to happen next.. is this a good thing or a bad thing? Could this workout well for Karen and her record label? I am sure it will workout well, we will all fight piracy together, it takes a brave person like Karen and her recording lable to take this first step and make an example to the rest! This is the way to go! :) Support the local music industry and you will hear good music all year round!!! yeahh.. v should support originals albums n stuff.. its not easy to produce an album.. but many ppl don see it.. they think dat its ok to buy pirated cds..
Karen n her recording company r really brave to do dat.. im sure not all the companies are willing to do it as it is really risky..